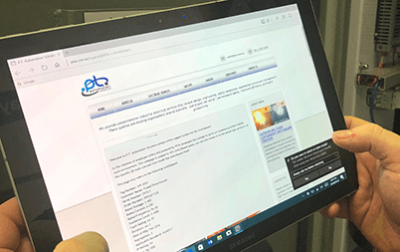 PTAS have developed and introduced a unique support portal for customers to always have access to as-built drawings, data sheets, safety manuals and much more. Our team identified numerous innovations that improves safety and productivity for personnel maintaining switchboards and its associated plant and equipment. All PTAS switchboards are now delivered with a QR code that provides backup ‘Installation and Maintenance Manual’ documents hosted on a secure private cloud portal. Our secure portal is accessible via a logon / password protected support page on the PTAS website. 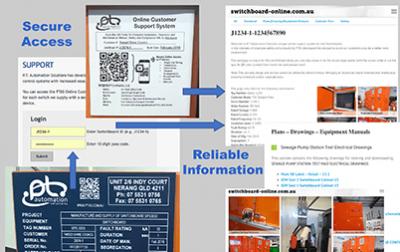 This website section can be accessed on the website, or by a QR scan included on the switchboard manufacturers label. At this point the owner is required to have the board identifier and the secure password to gain access to switchboard documentation. 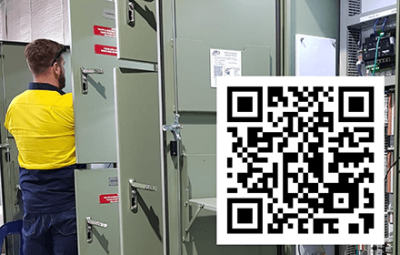 If physical switchboard access if provided to maintenance or operation staff via key locks, then an internal QR code is provided with direct access to the switchboard portal. Further security PINs, admin and/or customer QR codes can be provided as required. 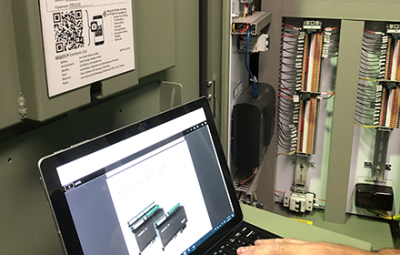 Too often (“half the time”) maintenance personnel are working on switchboards without drawings or manuals, taking unnecessary risks to resolve problems that will get essential plant and equipment back online. 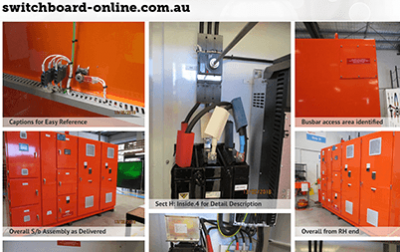 The Switchboard-Online portal provides access to safe working methods, drawings and component manuals. A gallery of referenced as built pics enable technicians to familarise themselves without opening the board. This is safer and faster. The portal may also allow asset owners to upload up-to-date data on the maintenance or inspection work just carried out. There is additional capacity provided by PTAS to include drawings, data sheets and documentation for mechanical and/or civil components of the project. So, the next time that switchboard’s data is accessed, all relevant, up-to-date information is readily available. All lockable enclosures are now fitted with a scannable QR Code that links directly to the switchboard-online website portal. Clearance for access for technicians is effectively gained by having possession of the key to the enclosure. Alternatively scan of the QR Code on outside of switchboard with a mobile device will enable standard login via the website. 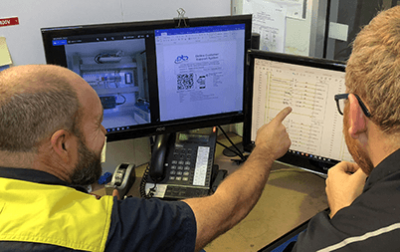 QR-OCSS increased productivity of staff by providing relevant information about the specific switchboard before and during maintenance activities. Technology associated with the connectivity of devices – the “Internet of Things” (IoT) is rapidly advancing. 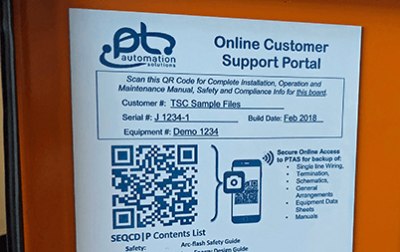 The QR-OCSS portal provides a key component towards accessing powered devices and equipment contained within and connected to the PTAS switchboards. 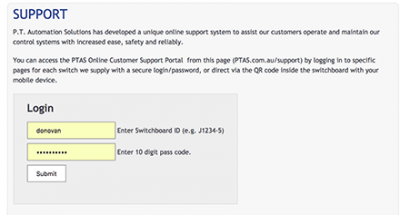 You can access the PTAS Online Customer Support Portal from the login page on this website here by logging into specific pages for each switchboard we supply.